There is a new lifesaver making its mark across the vast State of Western Australia – and it’s turning heads at the Avalon Airshow. Built in Switzerland and entering Australian service in December last year, it can usually be found as high as 45,000ft travelling at speeds of more than 400kts. This lifesaver is the Pilatus PC-24, the newest member of the Royal Flying Doctor Service fleet serving the most remote health jurisdiction in the world. Joining the RFDS during its 90th anniversary celebrations, the PC-24’s arrival in Broome on December 2 marked the culmination of a major transformation project that saw RFDS and Pilatus collaborate to create a world-class intensive care unit in the sky. “The … PC-24 jet epitomises the continued evolution of RFDS as the pre-eminent and most trusted provider of aeromedical services in Western Australia,” RFDS WA’s General Manager Aviation Geoff Horsley told Australian Aviation at the time. Named Victory, the PC-24 on display at Avalon has been dubbed the world’s first super-versatile jet by Pilatus. It has been re-purposed with a state-of-the-art aero medical fit out to serve as an in-flight emergency ward. 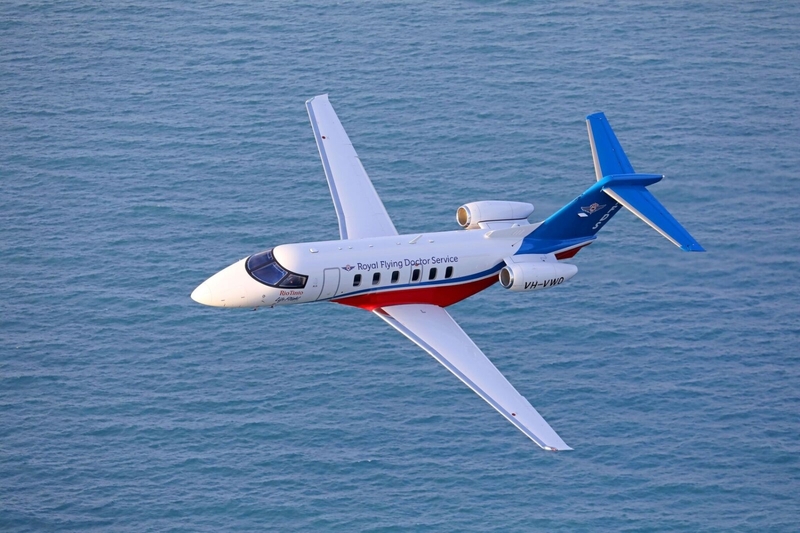 According to the RFDS, on individual performance, the aircraft will make a significant impact in long-haul and time critical scenarios, carrying multiple patients on a single flight and enabling critically ill patients to get to specialist care faster. The PC-24 will be deployed on time-critical missions where the speed of a Pilatus PC-12 from the 16-strong turboprop fleet is insufficient. What’s more, it is capable of operating in and out of short and unsealed airstrips. The RFDS’s Perth base with fully operational medical facility is located at Jandakot Airport. Alongside the medical facility, a state-of-the-art hangar and aircraft maintenance centre has been constructed, allowing the RFDS to undertake in-house maintenance on its PC-12s. These aircraft link the Jandakot facility with all corners of the state thanks to a network of regional bases in Broome, Port Hedland, Kalgoorlie and Meekatharra. The service of the Swiss-built jet in an aeromedical environment is a world-first, with the majority of existing PC-24s operating in a standard passenger or luxury jet fitout. “We have repurposed the PC-24 jet with state-of-the-art aeromedical fitout that serves as an in-flight emergency ward, and the aircraft is regarded as the ‘off-road’ aeromedical jet,” Horsley said. Unlike the turboprops, which receive their custom interiors at the Jandakot base, the PC-24s undergo their aeromedical fitout on Pilatus’ Swiss premises before arriving in Western Australia. 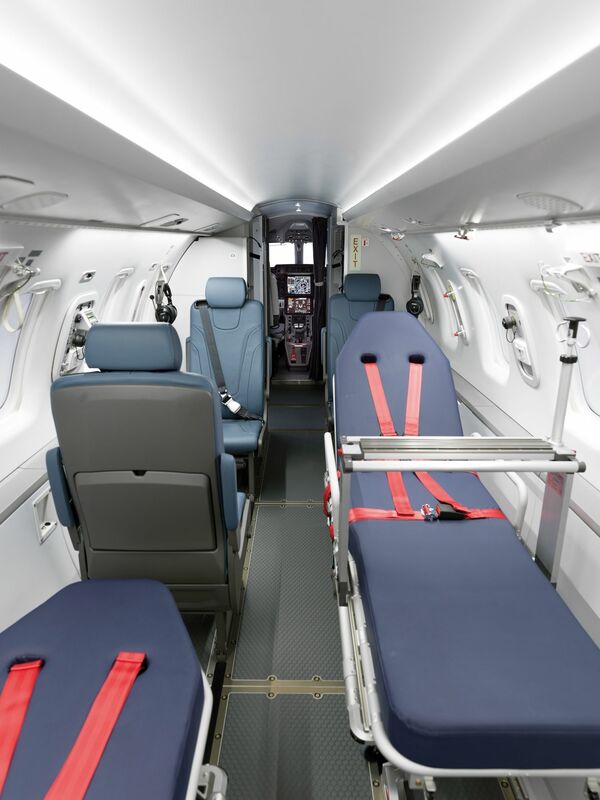 The complexity of the fitout gives some insight into the range of medical situations these aircraft are expected to handle. Such features include a large cargo door (1295mm x 1245mm), allowing for the rapid transfer of patients, including those with bariatric requirements. The interior also boasts an enhanced load capability medical electrical system with both 28VDC and 240VAC supplied. Wall-mounted supply panels are coupled with ceiling rails that support IV-hooks, enhancing the care delivery on-board. Dimmable cabin lights improve patient comfort and ambiance, while dedicated working lights have been installed above the three stretchers. Further improvements see a separate cabin intercom system that allows hand-held Satcom and VHF access for medical staff, enabling easy communication between the aircraft and the operations centre at Jandakot. The design also facilitates improved storage, including cabinets with drawers, ample shelves and worktables, much to the delight of the doctors and nurses who make a career serving patients high above the ground. The increased size and complexity of the Pilatus jet meant a new facility was required before the aircraft could begin services in WA. Work started on this building in 2015 and was completed in 2017. It sports a large maintenance hangar, capable of servicing both the PC-24s and the existing PC-12 fleet. Additionally, it provides a pilot base, training facilities, workshops and storage area as well as office space. With the hangar complete, the focus narrowed on the introduction of the PC-24. The RFDS team had been hard at work through 2018, both in Western Australia and overseas, readying medical teams to work in the new environment along with training to enable safe flight operations across the network. A recent milestone was the advanced training of RFDS’s team of engineers and pilots. During this program four RFDS engineers travelled to Stans, Switzerland and Detroit. “Fifteen of our pilots have completed PC-24 training in Dallas, USA and our doctors and nurses will participate in practical training on board the aircraft in WA before going into service,” Horsley told Australian Aviation. Another major advantage of the PC-24 is its flight-deck arrangement. As with the PC-12s, the aircraft has been manufactured for single-pilot certification with a cockpit layout that Horsley said is efficient and intuitive. 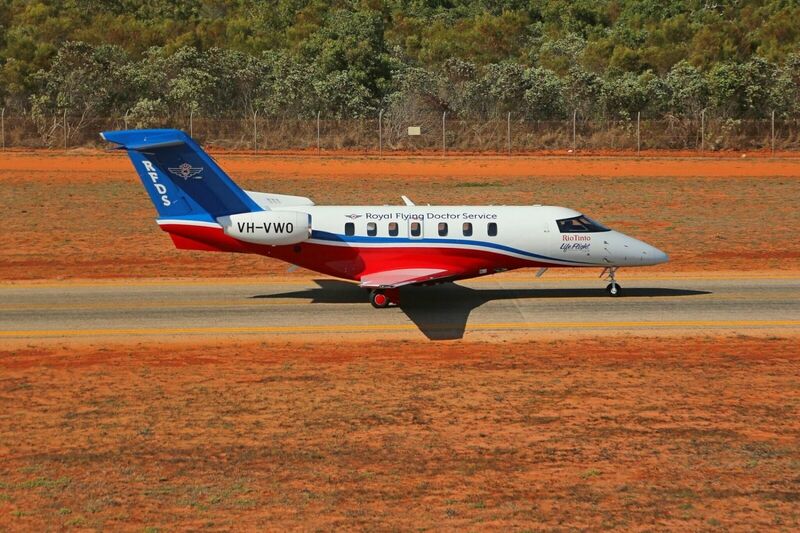 Great little jet for the RFDS, will slice hours off those long haul runs from the Kimberley top end to Perth. Had a look, through the fence, at VH-KWO at JAD on 26/02. Two delivered, two more to come. RFDS Western Operations introduced the Pilatus PC12-45 type in 2001. The first of the Pilatus PC12NG aircraft was acquired in 2009.